"What are you even doing here, princess?" Moana is Walt Disney Animation's latest take on their tried and true Disney princess formula with enough progressive, contemporary twists including its Pacific Islands setting to make it stand out. Inspired by Polynesian culture, the animated film uses folklore and broad cultural traditions to emphasis its themes of adventure, empowerment, and exploration rather well. Voiced by sixteen-year-old Hawaiian newcomer Auli'i Cravalho, the title character is full of bold energy playing against Dwayne Johnson's demigod Maui and his comically commanding vocal performance. Essentially a two-hander, the two characters anchor the bulk of the film bickering about their heroic journey with song breaks and the usual comedic bits peppered throughout. Directed by Ron Clements and John Musker and written by Jared Bush, the film is brimming with plenty of likeable elements including enough catchy, original songs co-written by Hamilton creator Lin-Manuel Miranda to make your heart swell amidst the breathtaking South Pacific visuals. Moana (the character) proves to be a strong female character with her own sense of agency and a mostly respectable, if still westernized, portrayal of a foreign ethnicity thankfully lacking any Prince Charming love interest or an entirely unrealistic body image. 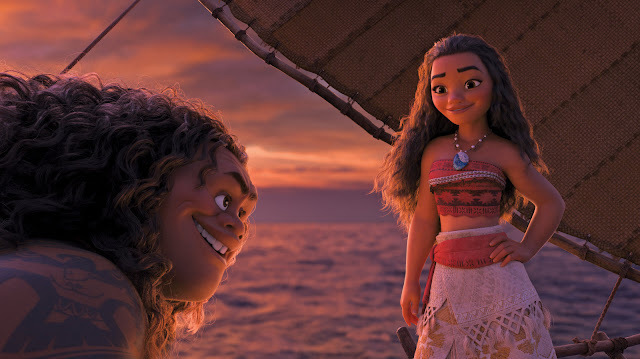 Moana is a familiar but enlightening animated family adventure in the traditional Disney mould with an unapologetically feminist bent and fun South Pacific touches. Cravalho and Johnson have great chemistry vocally as the buddy comedy duo expresses some worthy themes with a tolerable amount of cultural appropriation.